Luddites and York: Why Remember? As Martin’s post from earlier in the summer has indicated, York’s Alternative History are currently thinking about ways in which we might organise some kind of event to formally mark the two hundredth anniversary of the execution of a group of Luddites at York Castle. We’ve been bouncing ideas back and forth around our monthly meetings for a while now, but as the date in question is now a mere five months away, it’s probably time to begin formalising some of these thoughts and start trying to put schemes into action. As ever, though, history is a process and a conversation more than it is an arrival or a conclusion, and we want to facilitate discussion about what people would like to see take place in January next year, how they might want to participate, what they feel about the act of remembering the people who were executed in 1813, and what (if any) resonances there might be between past and present. To this end, I’m going to try to blog here semi-regularly on how our attempts at organising a Luddite remembrance are going: partly as a means of fuelling interest and opening up potential conversations and engagements about the topic, but also I think partially as a means of demystifying the act of remembrance itself (if that makes sense). Not only am I a faltering novice when it comes to the intricacies of eighteenth century labour history, but I’m also alarmingly inexpert at the business of organising events. I suppose I worry sometimes that the formal, death-suited, business of Memory (with a capital ‘M’) is too stand-offish, arms-lengthy, and patrician and that can risk alienating popular involvement sometimes. I think of YAH as something that tries to be in the business of putting history to work in the present, using it to potentially reshape our shared now for the better, and by showing those things as ongoing activities rather than as faits accomplis it might encourage people to join in whatsoever way they see fit. I just rather hope that if we can open up the process of doing ‘memory’, then the end result of a commemorative event might feel less formalised and more inclusive. That’s the justification of my ramblings, at any rate. 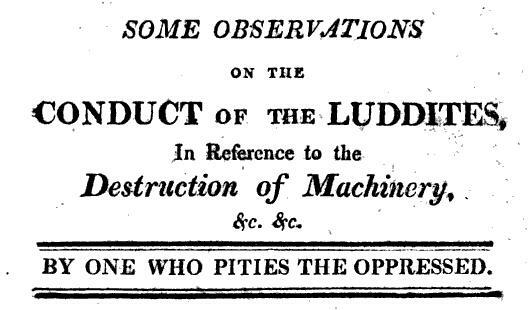 There are a whole swathe of smart, informative, brilliantly organised, and politically-engaged festivities and commemorations going on throughout 2012 to remember the Luddites. Many of these events are closely tied to the places where uprisings occurred, as would be expected. York is a little different. Its place in the Luddite story is the back-drop for the narrative’s dénouement: the place of the trial, execution, and dismemberment of men accused of Luddite activity across west Yorkshire. Broadly speaking there were three areas in which Luddite activity broke out in 1812: Nottinghamshire, South Lancashire, and West Yorkshire. The events in this latter area were almost all confined to the region around Huddersfield and Halifax. Because York was the administrative and judicial centre of the county, once arrests were made, the accused were brought to the city to stand trial. On the 6th of January 1813 three men, George Mellor, William Thorpe, and Thomas Smith, were tried for the murder of mill owner William Horsfell, who had been shot of the 28th of April the previous year, at Crosland Moor near Huddersfield. Pleading innocence, they were convicted that evening on the testimony of an informant, hanged behind the prison two days later, and their corpses were taken to York Hospital for dissection. On the 9th of January a second trial took place of a group of men accused of an attempted attack on a mill owned by William Cartwright at Rawfolds, near Cleckheaton. Some were acquitted, most were found guilty, and in total fourteen men were executed on the 16th of January, standing condemned for taking part in Luddite activities. There seems little to celebrate in York, and much to mourn. Why, then, should we remember at all? I guess this is one of the questions I want to turn over during the coming months in this space, as we think about what the purpose of remembrance might be and the means by which those purposes might be achieved. Some of the slippery difficulties we have with social memory are systemic – that is to say there are bigger problem than just the Luddites themselves, part of a much wider problematised relationship we have with memory-against-the-grain – but some issues surely in this instance are to do with the subject in hand. As many people better versed in the subject have been strenuously pointing out over the course of this year’s memorial activities, the present’s social memory of Luddism is somewhat off-beam: crazed guys smashing stuff up for shits-and-giggles, forlornly attempting to impossibly reverse the tides of progress. In fact, we need to re-remember them: to understand that they were not individuals who arrived at their actions as a result of a thoughtless and wanton compulsion to wreak havoc, but rather they were people who committed deeds derived from structures of value, making decisions based upon rational choices in a context of extreme desperation. These contexts, the political and economic circumstances in which they found themselves, are something that I’ll write about further another time, but suffice to say there are some alarming and uncanny echoes of that desperation today, more than enough to indicate that even if this year were not the apposite bicentenary of their activities, theirs would still be a powerful narrative that the present could be looking to for insight into the contemporary world (and no, I don’t just mean all like ‘computers’ and stuff). History works by analogy; it’s not so much that things ever come around twice, or even rhyme. It’s more that the narratives-of-then are reminiscent somehow of the stories-of-now, they end up telling us something about ourselves that we hadn’t even noticed, and in some cases might just act as catalysts for a will to change. And will to change is, ultimately, the most important thing.